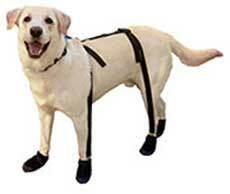 Snuggy Boots Dog Suspender System Protects Your Dog! The elastic leg straps continuously pull on the booties keeping the tips of the front paws and toenails at the front of the boot to prevent tripping and wearing off the tip of the dog shoes or sock. The elastic leg straps make it unnecessary to over tighten Velcro straps to keep booties on the paws. Over tightened Velcro causes chafing sores around the ankles and restricts circulation. The elastic leg straps allow the Velcro straps to be as loose or snug as the pet owner and pet are comfortable with. The elastic leg straps stay attached to the footwear all the time. This keeps the dog footwear together in one place making it easy to find and keep track of all four pieces of footwear. The suspenders make sure the same shoe goes on the same paw each time, allowing the shoe to gradually conform to a left or right and back or front paw. Without the elastic leg straps holding the dog shoes or socks in place they can frequently fall off and having to put them back on over and over soon becomes an aggravation and discourages continued use. The suspenders being attached to the shoes or socks beforehand makes it easier to put the shoes or socks on because after the first shoe or sock is in place the elastic leg straps help to hold the footwear in place and pull it on. The leg straps pull on the top of the sock preventing slipping and sagging. When only Velcro straps are used the footwear can become uncomfortable to the dog because each shoe is uneven, part way on and part way off. The pulling tension of the elastic straps can help older dogs walk without limping and offsets the extra weight of the shoe on each paw. Athletic training and conditioning for canine sports such as agility is improved with the use of Snuggy Boots Footwear and Orthotic Suspenders. Keeps dog booties or socks on even when the dog sits or lays down. Here’s how to order yours.